Valencia Bonita is the newest 55+ all-inclusive lifestyle community in southwest Florida. A luxury gated resort community in Bonita Springs, Valencia Bonita by GL Homes has been designed for its active residents with amenities such as a 45,000 sq.ft. waterfront clubhouse, a full spa, a full-time on-site Lifestyle Director, pool, tennis, pickle ball, two dog parks and more. The community will have 997 single-family and villa homes on 347-acres when completed. 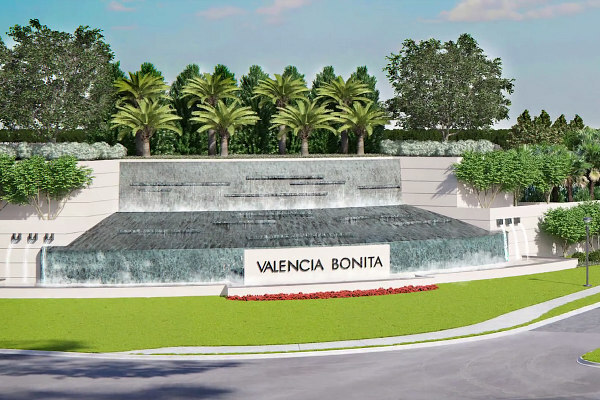 Valencia Bonita will offer 20 floor plans for Single family homes and attached villas, with screened and covered patios, luxurious master suites with walk-in closets and home sites with waterfront, preserve and garden views. Priced from $309,900 to $594,900 with 2, 3 and 4-bedroom designs and 1,738 to 3,350 square feet under air. Call or email me for more information on Valencia Bonita and to visit the Model Homes. Sign up to receive updates on this new community.